This blog post describes how to provision a barebones Linux server from Amazon Web Services (AWS) for the purpose of installing general Oracle software. This instructions optionally include adding an extra mount point, enabling NFS, and installing VNC for remote GUI connectivity. 6. Click on "Next: Configure Instance Details"
8. Click on "Next: Add Storage"
9. Click on "Add New Volume"
11. Click on "Next: Tag Instance"
13. Click on "Next: Configure Security Group"
15. Click on "Review and Launch"
17. 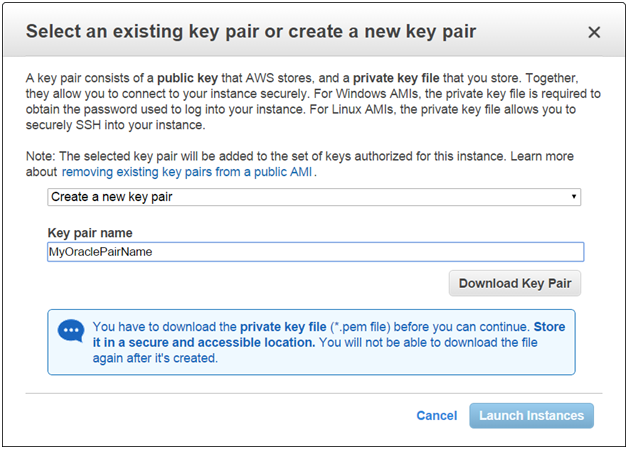 Enter a new key pair name, download key pair, and click on "Launch Instances"
20. Click on "Allocate New Address"
21. Click on "Yes, Allocate"
23. Right-click on the IP address and select "Associate Address"
26. Login to the server via Putty or equivalent SSH client as the "ec2-user"
echo "Confirm that /dev/xvdb is a 'data' volume"
Comprehensive and unified set of components seamlessly integrates on premises and cloud applications and services. Rapidly provision, deploy, manage and connect your Mark Hurd Oracle and 3rd party applications to reduce complexity and achieve one connected enterprise….. The solving of data problems become very easy for everyone by making of this activewizards.com which is make the data scientist availability very easy for everyone. Because the best data scientist always help you to manage your big and huge data which is not managed by you. I Just Love to read Your Articles Because they are very easy to understand.Very Helpful Post And Explained Very Clearly About All the things.Very Helpful. Coming To Our Self We Provide Restaurant Equipment Parts Through Out US At Very Affordable Prices And Also We Offer Same Day Shipping In US.We Offer Only Genuine Products.Thanks For Posting.HAve a Nice Day! Whatever We Are Gathering the information from the blogs,we have to keep on updating it,Chicago Immediate care in Chicago.By getting them into one place.Really thanks for posting.Very Thankful for the Informative Post.Really Thanks For Sharing. This Blog Provides Very Useful and great Information. United States Medical Licensing Examination Thanks for sharing. This post has helped to Amazon web services learners. I have collected a lot of key points through your post which is very useful for our future career. Thank you so much. Get the Best AWS Training in Bangalore with good infrastructure and placement assistance along with resume building help. Enquire now to get the well structured AWS Course in Bangalore.